I made this yesterday for my clients, for the Meal Delivery Service and it was so amazing I wanted to share the recipe..
1) Bake sweet potatoes at 400 degrees until tender, about an hour and 15 minutes. 2) Sauté shallots in butter until tender, add pineapple, sugar, cranberries add thyme and simmer until thickened and liquid is absorbed. Add balsamic vinegar and remove from heat. 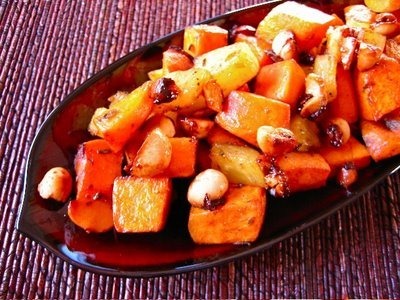 Serve over sweet potatoes.